Most of us tend to fall into a habit and then we just stay there. The food we eat is a great example of the sorts of habits we fall into. If you grew up on heavily processed foods, you probably have a taste for them. Without real work, it’s hard to break that food habit. The truth of the matter is that I would probably still be eating huge amounts of gluten if it weren’t for the extreme sickness that I started to display in the last year or so. Before, when I was sick, I used to say things like, “I’d never cut ___ out of my diet. That’s just too extreme!” I thought the idea of removing a food group would just be WAAAAY too hard. 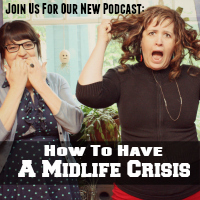 The funny thing is, living with chronic illness that presented in weird ways, mostly in my overall functioning in the world and in my mind – THAT was way harder. I think one of the hardest things about changing your diet is finding new foods to eat. I remember when I was first doing the elimination diet and it was really hard. That time, I really wasn’t strict enough to fully isolate what foods were causing me trouble. Even the second time around doing the diet was HARD! There were many hard aspects, but for me, the hardest was finding good foods to eat, that were allowed on the diet, that tasted good and that were easy to make. I thought that today I’d share a few of my favorite quick AM recipes that I eat (or really drink) together to get my day off to a great start. These recipes are really the ultimate comfort food, but not in the way that you’d think of comfort food. These are foods that are great for the gut and for the skin – well, really for your entire body, but you’ll see it on your skin and feel it in your belly the most. The first recipe is one that needs to be made ahead, so maybe that’s cheating a bit in the quick department. However, the way I do it, it’s a grab and go situation during the week, so it is actually very fast. My first recipe is bone broth. 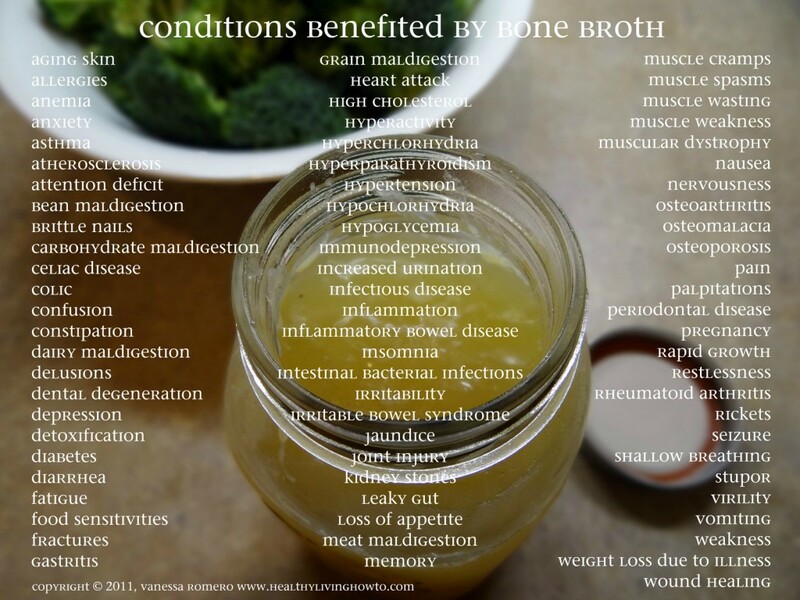 Bone broth is one of THE MOST healing foods you can consume. 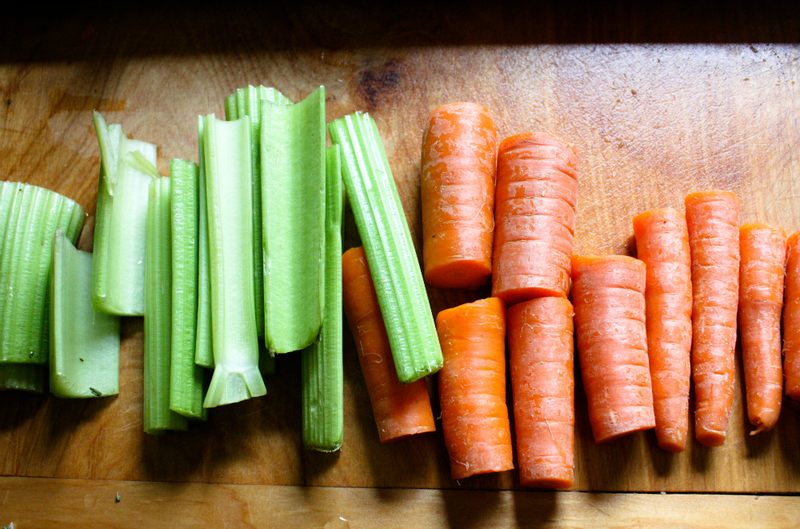 What makes bone broth different from any other broth? The main thing is that you add apple cider vinegar, which helps release all of the micro-nutrients from the bones. Also, you cook it MUCH longer than regular broth. To be honest, even if I stopped eating meat (which I don’t have plans to do at the moment, but I was once a vegetarian, so I think I could be again), I would still drink bone broth, because it’s really one of the best foods you can put in your body. My second recipe is a green smoothie drink that I’ve been testing out. One of the more recent facts that I’ve learned about making green smoothies is that you want to be careful not to use a raw veggie that will be too harsh on your body. You can par-cook the veggies to make them less harsh on the system, but that’s kind of gross for me and it takes too long, so I’ve come up with a green smoothie recipe that doesn’t take too long and isn’t too harsh on the body. I’ve found a number of recipes online and I’ve tested them out. There’s really only one recipe that I absolutely LOVE and it’s from Nom Nom Paleo. I’ve modified it a bit so I thought I’d list out what I do for my version of the Nom Nom Paleo recipe. The birds must be raised organically no later than two days after they hatch. They must be fed certified organic feed for their entire lives. Organic feed cannot contain animal by-products, antibiotics or genetically engineered grains and cannot be grown using persistent pesticides or chemical fertilizers. It is prohibited to give drugs, antibiotics and hormones to organic birds (please note: federal regulations prohibit the use of hormones in raising poultry). All birds must have outdoor access. If you use a cheap bird, there’s no point. It isn’t that good for you and you defeat the entire purpose of making this. <– said the food snob. 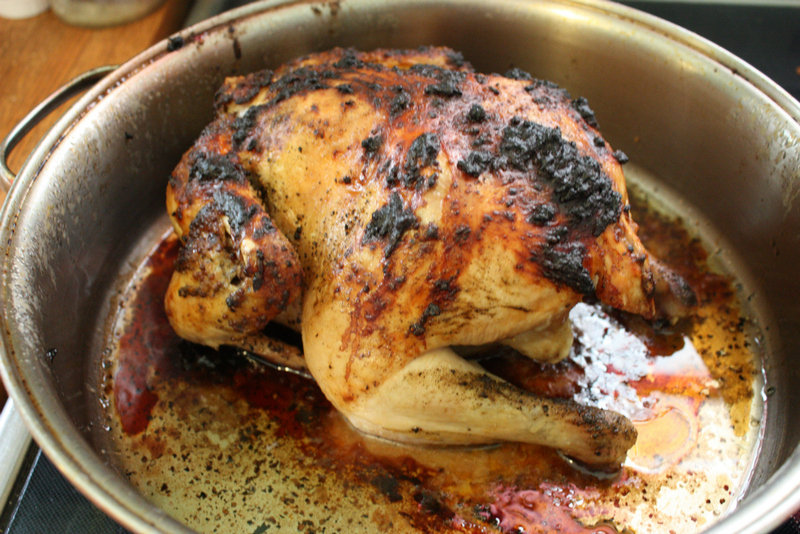 So you cook your chicken (in case you don’t know how to cook a chicken, here’s a recipe I’ve used before). 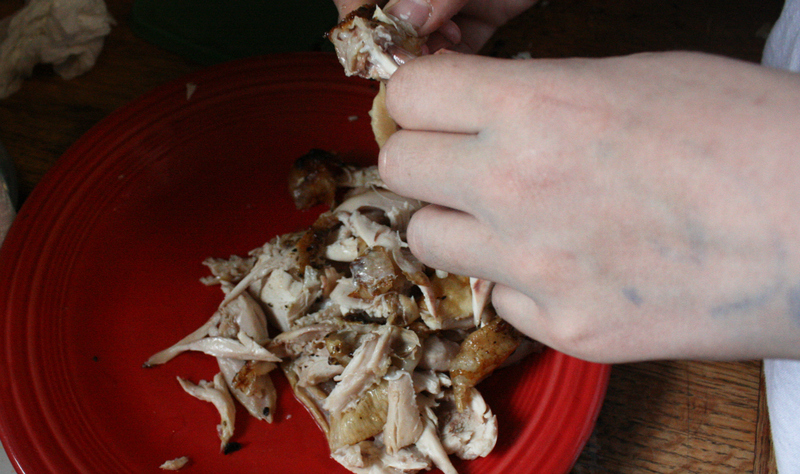 Then you remove and save as many of the bones as you can from the chicken. You can actually save all the weird parts and throw them all in. 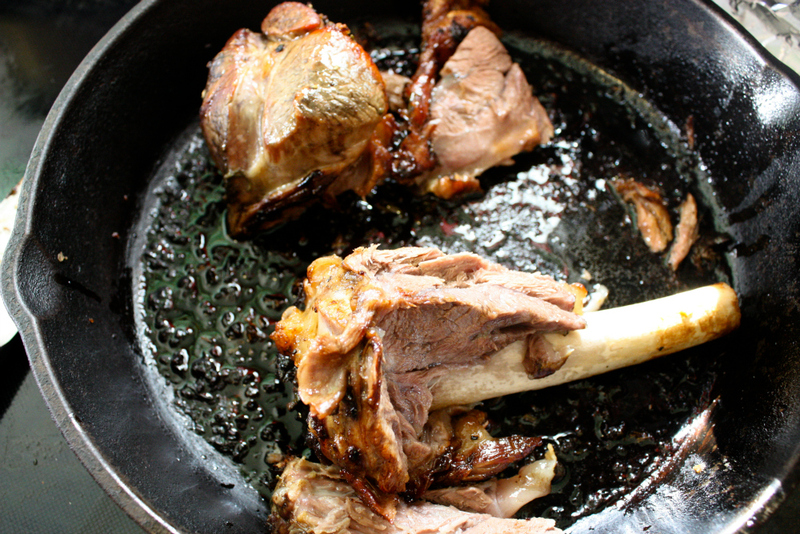 For my best and favorite bone broth I also add a lamb shank that has a little bit of meat left on the bone. If I have other veggies in the crisper sometimes I throw those in too – this is a great use for veggies that are nearing the end of their lives. Put all of the ingredients into the crock pot except the water, then fill the pot with water covering all of the ingredients. 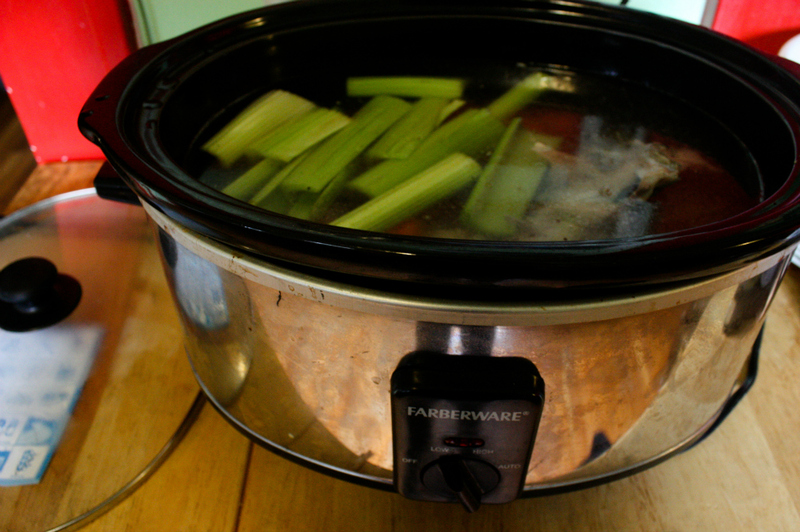 In some crock pots this will fill the pot to the top and in others it will be about 2/3 of the way full. I usually add extra ingredients for mine because it’s a larger one. 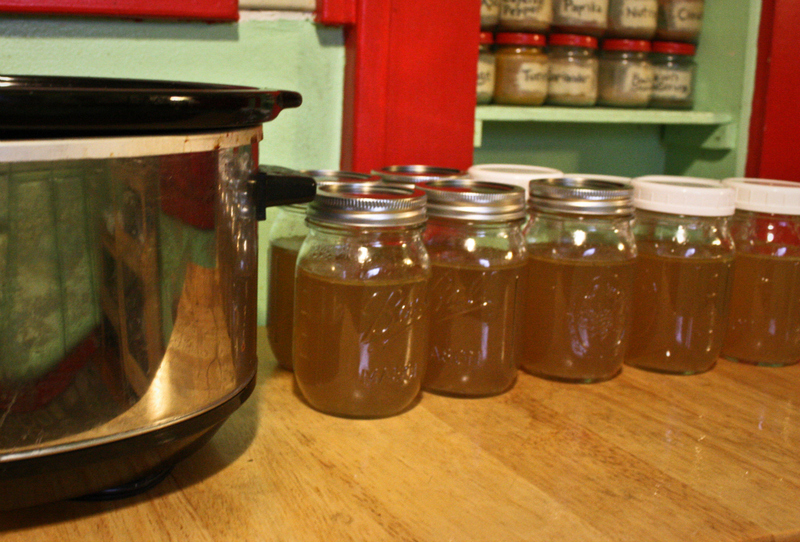 I get 16 cups of bone broth out of my crock pot, but most people will probably get somewhere around 8-10 cups. Set the crock pot to low, put the lid on it and walk away for 24 hours. One of the awesome things about this recipe is the entire house will start to smell like the most awesome place in the universe! Making bone broth is really almost like a ceremonial act of self care. You are able to enjoy it on all levels. First you make it and anticipate it, smell it, savor it in your mind and then you bottle it up, eat some and save some for a rainy day. There are few better ways you can take amazing care of yourself and your family (if they will drink it) than this. 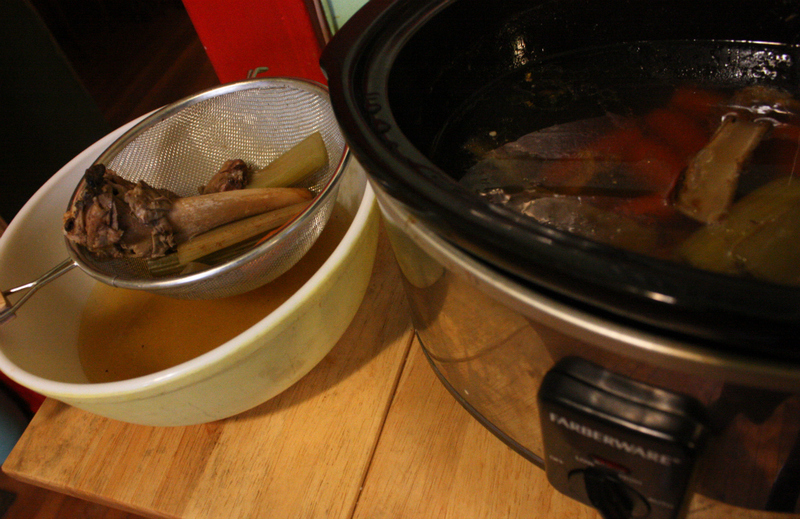 24 hours later you’ll have wonderful bone broth. All you need to do is strain out the bigger bits (don’t try to save the veggies or meat; they are totally stripped of everything by the end of this cooking process). What I do to strain everything is grab a big mug and start pouring it through the finest strainer I have. I pour the broth into mason jars with a little extra room in them so I can freeze half of them. This is enough bone broth for a few weeks for me! Now for the green smoothie recipe. 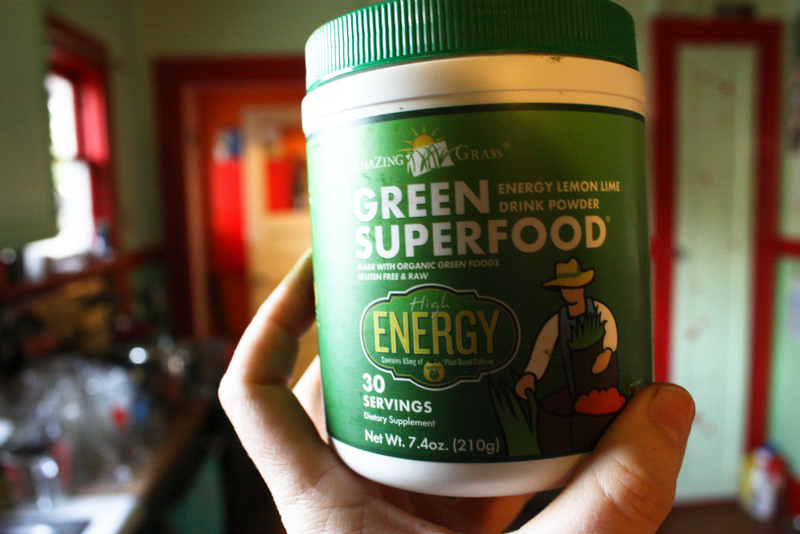 1 or 2 scoops of Green Superfood (a powder I buy at New Seasons). I add all of these foods to my Vitamix. 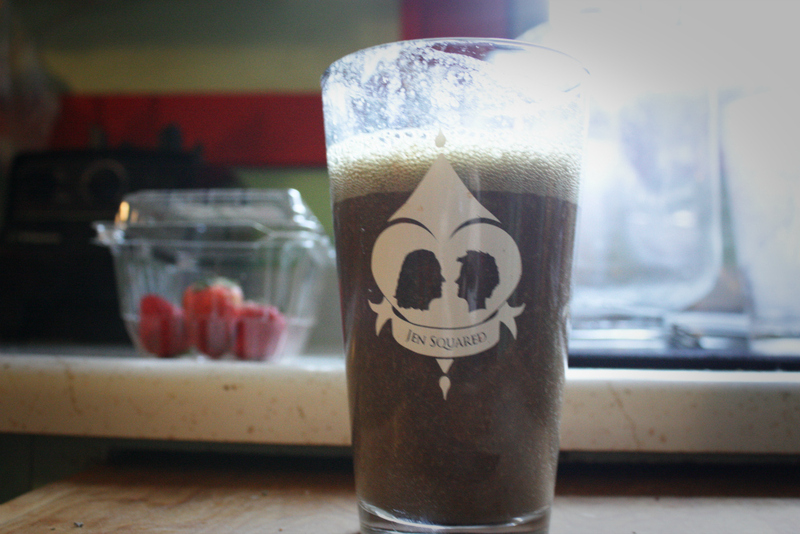 BTW, I cannot say enough good things about the Vitamix. Since I’ve purchased mine, I’ve been drinking smoothies consistently and SERIOUSLY upping my fruit and vegetable intake. It pays for itself healthwise. There are some less expensive versions of this blender out there, but I don’t know enough about them to speak of them. The reason Vitamix is so great is that it can really break things down to the smoothest version of a smoothie that you’ve ever seen! This helps with digestion (less to break down), with drinkability, and with taste – these taste like you got them from a professional smoothie shop, but they are much healthier because you made them yourself. OK, so once you’ve blended everything, pour it into a glass and drink it. This recipe will make it a smoothie, but not too thick or thin. Change the amount of water or coconut milk to change the thickness or thinness of the drink. Here are the reasons I eat these foods regularly together and why I paired them today. 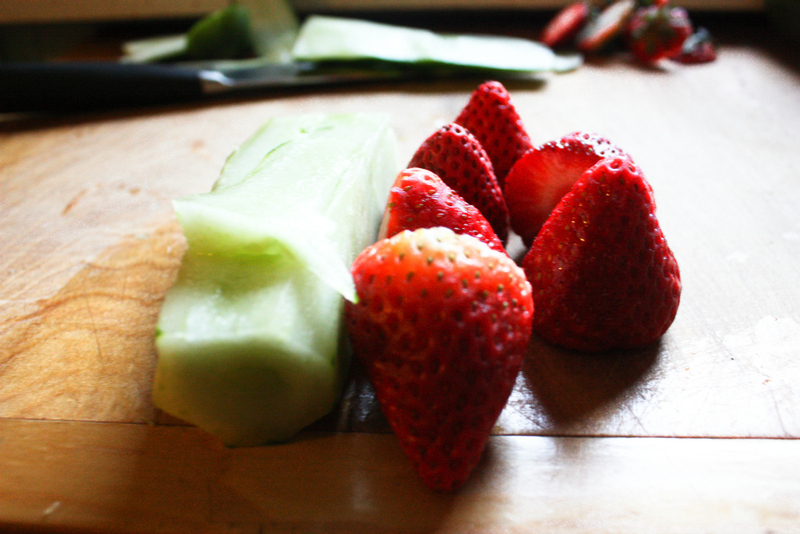 Digestion & Healing – these are easy foods for your body to digest. Even if your body is healthy, it will thank you for giving it something that is low allergen and so easy to consume. You’ll know your body is saying thank you when you look in the mirror the next day and see your skin is a little healthier looking, or maybe the wrinkles around your eyes are slightly less visible. Over time, eating these foods regularly, you’ll be amazed by the results! Hot & Cold – it’s not always ideal to drink smoothies when it’s cold outside, because it’s just too cold out and you don’t want to be cold inside too, so a way to help normalize that is to drink something hot and healing while you drink something cold. Easy – you can make this breakfast in about 2 minutes for the smoothie and however long it takes for the bone broth to heat up in a pan. You can also pour them into jars and drink them on the go if you need to. It’s pretty awesome because these two drinks actually fill you up in the morning. You don’t need more food unless you’re working out or doing something really strenuous, and even then maybe a handful of nuts is all you’ll need to have plenty of energy. You won’t feel hungry again until lunch (or at least, I don’t). Because this is food that your body can digest so easily, you will find your stomach will be small after drinking these foods – that is, until you eat something that’s not so good for you and your belly sticks out again. But maybe that’s just me. I find that when I eat this way for a few days I feel GREAT! Stronger, healthier and with a smaller waistline than usual. Today’s photos of me were a total fail. I didn’t want to take the pictures and I couldn’t find my remote. So I used the timer and was running to get into the shots. Fail. But, look at my big tough guy muscles! Today I’m 193 lbs – up a few pounds, but I think it’s muscle that I’m gaining here. I have been sprinting in the last few weeks in my exercise class and my legs feel like solid steel. I think some parts of my body are actually getting a bit bigger (like my legs and booty) but that’s fine with me. I’m up for whatever this experiment in exercise and eating right has to offer me. I keep feeling stronger all the time, and what’s strange is I already felt strong. I keep thinking to myself, “this is as strong as I can be,” and then I feel stronger. It’s a strange time. It’s a great time. I’m still learning about myself and I’m still surprised by this process. So do your body a favor, give it a break, take care of yourself and make some bone broth and a green smoothie. 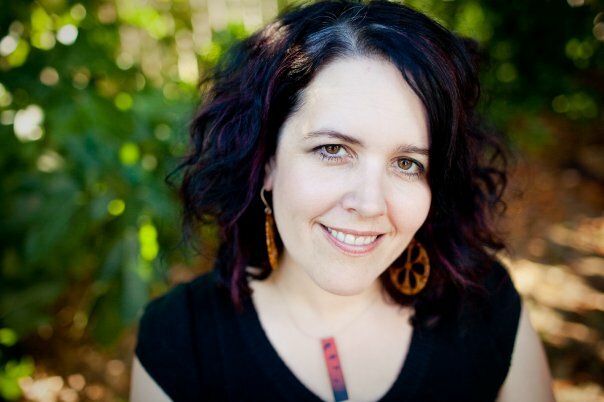 You’ll receive thank yous – from the inside out, all over your body. I’ve been following your progress and I love the recipes you’ve included here. Are there any posts that have an example menu of what you might eat in a week? I’m interested in following in your footsteps. No, you know I don’t have a week’s worth of foods just yet on the blog, but I was just thinking of a week’s worth of recipes too. So what you see today is my attempt at starting a list of foods that I eat regularly. What I’m thinking I’ll do is write individual posts and then once I have them all done I’ll do a post that links to all of the other recipes to give you a week in the life of me and the foods I eat. So, in other words, I’m working on this and will have it done very soon! Thanks for keeping up with my progress!